PinkyPiggu: Two Wings @ Bukit Merah ~ One Of The BEST Chicken Wings I've Tasted In Singapore! Two Wings @ Bukit Merah ~ One Of The BEST Chicken Wings I've Tasted In Singapore! Two Wings, because one just isn't enough. Two Wings, because two is always better than one. But but but... this PinkyPiggu want to eat more than two wings, because it was so awesomely delicious! This is one of the best deep-fried chicken wings I've tasted in Singapore! Salute at Blk 119 of Bukit Merah Lane (behind Alexandra Village Food Centre) could be the most un-local local coffeeshop in Singapore. Unlike the usual stalls selling local comfort food such as bak chor mee or chicken rice, we can only find western grub here. Home to Seasalt The Seafood Place, Immanuel French Kitchen and 面miàn by The Travelling C.O.W, as well as the popular DeBurg Burgers (until they moved out recently), the newest addition to the family (since 1st May 2014) is none other than Two Wings which specializes in chicken wings. But the ply of chicken wings hawker trade is not exactly new to founder Jeremy Loh (seen in the above picture with his partner, Samantha, and yours truly). His granduncle was selling deep-fried wings in the Toa Payoh Lorong 5 food center since 1970s, and Jeremy would visit the stall often as a kid. Though Granduncle has long retired, he has unselfishly passed on the legacy of his special recipe to two members within the extended family. Carona Fried Chicken Wing Rice was subsequently established, experienced a success boom in the 1990s, eventually suffered a franchise failure and has been long defunct. 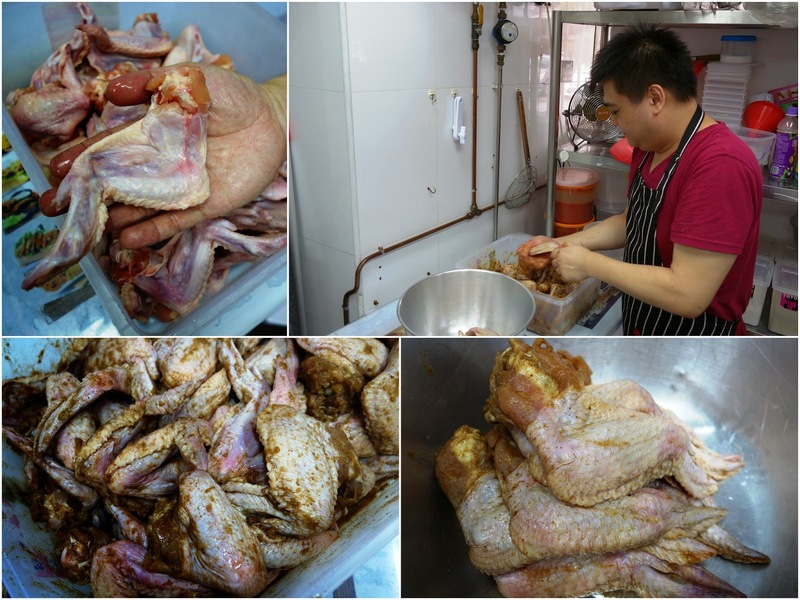 We were told that the current owner of Victor Famous Fried Chicken Rice at Veerasamy Road used to run Carona Chicken and is one of the family members who has benefited under the tutelage of Jeremy's granduncle. Jeremy, of course, is now the latest and youngest disciple of his granduncle. Starting off from a humble canteen stall at Kallang which he described as his 'training ground' for 6 months, not only has he learned the secrets and techniques of the original recipe from his granduncle, he has even further fine-tuned it to ensure his chicken wings captures the adoration of modern palates. For instance, in his granduncle's days, the chicken wings used are of a smaller size, usually no more than 100 grams per wing. But we like it plump for a more satisfactory bite, so Jeremy specially sourced his bigger-sized wings from Brazil. Size does matter. No expenses is spared to ensure ingredients used for seasoning and batter are of premium quality. A sesame oil supplier was trying to pitch his product to Jeremy but backed off once he got a whiff of what Jeremy is using, because he knew he can't match it. Lest you start wondering if Jeremy will get too adventurous and deviated too much from granduncle's original recipe, I can imagine any evolvement can only be in a good way. Afterall, granduncle is already in his 80s, but still swings by often to ensure the chicken wings are of consistent quality and matches up to his standard. 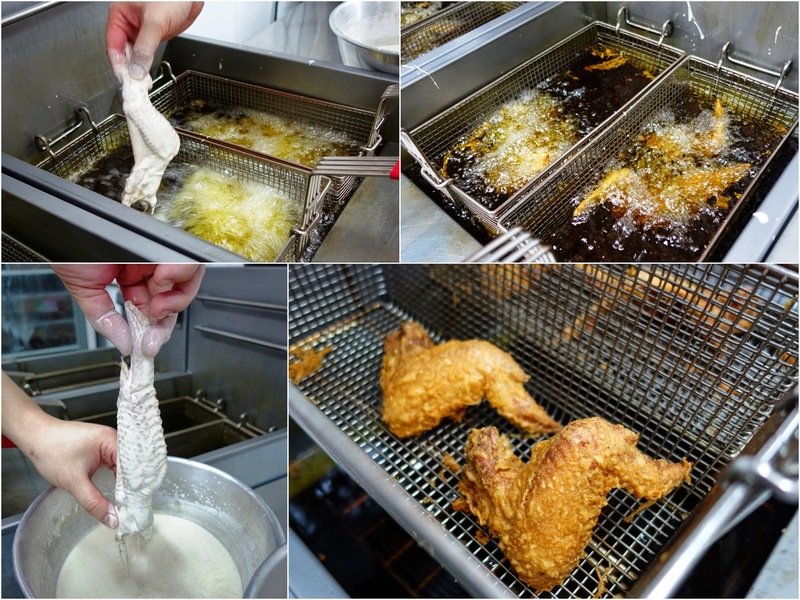 The Chicken Wings ($8.50/4pcs, $12.50/6pcs, $24/12pcs) are freshly fried only upon order, so expect a slight wait, but what you'd be getting is nothing short of amazing. The first thing you'd noticed is the wings' beautiful golden brown exterior and nary any trace of oil can be seen on the wooden serving board. Next comes the exciting part! A bite into the wings rewarded my mouth with hot crackling crispy skin, before filling it with fleshy, succulent meat. It was certainly well-marinated, but not over powering the natural taste of chicken. The best part was, the wings did not taste greasy at all. I just ate and ate with minimum feelings of calories guilt hehee. Super amazing, I must say! But I do not agree with the so-called 'correct way' of eating chicken wings, which is to pull off the cartilage and bones before eating it boneless. The utmost enjoyment is to tear the skin apart with your teeth, slowly chew off the meat, gnaw every tiny bit left off the bones, and licking the juices off the fingers (mid-joints and tips are the best!). Not to be rushed, but slowly savoured. The chicken wings at Two Wings were more than finger-licking good. Worth a special mention is the homemade chilli sauce. Much like the chicken rice style of chilli, it was zesty with aromatic notes of garlic, and epitomize the right level of consistency and spiciness level. The fabulous chicken wings dipped in this superb chilli made the most delightful pairing. It rekindled memories of my younger days when I enjoyed Carona Chicken so much. To provide variety for his customers, Jeremy also offers other parts of the chicken such as Drumstick, Thigh, Breast ($9/2pcs, $12/3pcs), as well as Spring Chicken ($9.90/half, $15.90/whole) and Chicken Cutlet ($8), which all comes with 2 sides like the rustic-style homemade Chilled Mashed Potato Salad. Prices are noticeably higher than what you would pay for at a coffeeshop's western food stall, but the quality of food has proven to be comparatively higher too. The unassuming looking chicken cutlet turned out to be a favourite among some of us at the table. We initially thought it to be boring and oh well, just another piece of chicken, but its coat of crunchy exterior revealed a most tender thigh within. Texture wise, it has hit all the right notes. Taste wise, it was indeed flavoursome. If you come in a big group, I would also recommend getting the Finger Food Platter ($19.90) to share. Described by Jeremy as 'nibble heaven', it consists of 3 pcs Chicken + 9 pcs Chicken Strips + 6 pcs Spring Rolls + French Fries/Potato Wedges + Onion Rings + Cucumber & Carrot with dip. Still not enough? Get Cheese Fries ($4.50) too! What's not to like about those addictive thickly-cut fries drizzled with cheese and mayonnaise? Decadently yummy! Some of Jeremy's customers feedback to him that the chicken wings they had dabao (takeaway) back home remained crisp even after a few hours. Such pride you can tell from Jeremy when he told us this, but we still have to put it to test. Alas I returned home too late in the evening, but Catherine, another blogger who was also with us at lunch, shared on her instagram post that "the chicken skin stays crisp in humid weather even after three hours! Amazing batter!" Thanks to Uncle Smart who discovered and shared with us this amazing chicken wings stall, and Jeremy & Samantha for their warm hospitality. Updated on September 29, 2014 with YouTube Video!